Back in 2001, I worked the summer at Cedar Point Amusement Park, in Sandusky, Ohio. I worked a lot of hours, but had a blast on the days I got off. 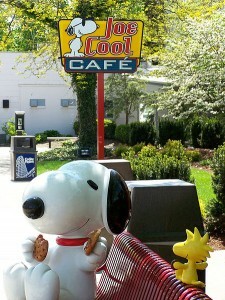 I remember one day I stepped into the only buffet restaurant they had and Snoopy was there. Just a little side note, Cedar Point has a place for the Peanut characters that is an area filled with rides and games just for the kiddies. So, back to the story… Snoopie made an appearance at the restaurant and was greeting all the children. I remember all of a sudden this big guy practically jumped over his table and tackled Snoopy. He then started beating the tar out of Snoopy. The thing is, the person within the costume was a barely 5 foot tall girl. She did not know what hit her and by the time everything was done, she had to be sent to the hospital and kids were hysterically crying. Of course, a lot of the parents were upset too. I wondered: What set off that man? What did Snoopie do to him? Did it ever occur to him that he would probably traumatize a lot of children for some time? Sometimes the answer does not have to totally be correct, but in this situation, children are looking for comfort, and not confusion.